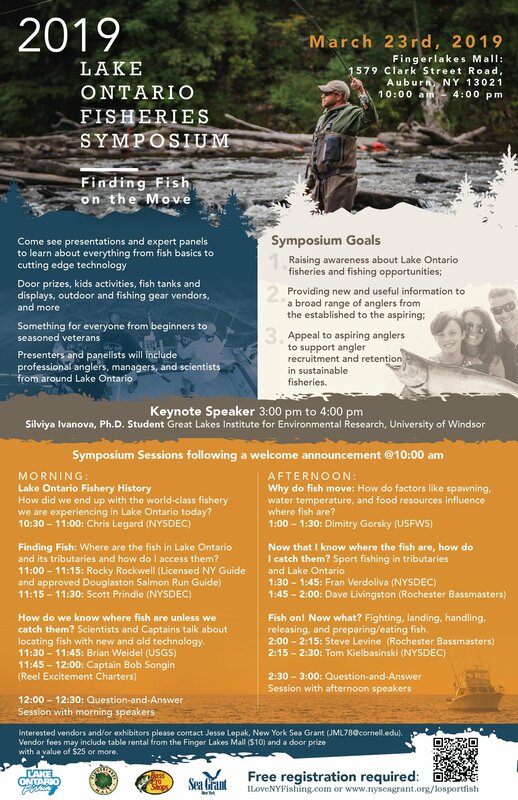 Please join us for the 2019 Lake Ontario Fisheries Symposium (Fish on the Move) at the Fingerlakes Mall on March 23rd from 10:00 am to 4:00 pm. Learn about fishing on Lake Ontario and its tributaries from experts around the region. We are offering 10 educational seminars throughout the day with question-and-answer sessions following morning and afternoon speaker sessions. Our keynote speaker (Silviya Ivanova, Ph.D. Student with the Great Lakes Institute for Environmental Research, University of Windsor) will discuss her research tracking salmon and trout in Lake Ontario at 3:00. Come for one presentation, or spend the whole day. Take a tour of Bass Pro Shops and see the fish displays. There will also be a variety of posters from fish managers and researchers in the area, and activities where you can learn more about fish, fishing, and fisheries. There is something for everyone, young and old, novice and expert. This event is brought to you by The Lake Ontario Sportfishing Promotion Council, the Fingerlakes Mall, Bass Pro Shops, New York Sea Grant, and many other partners. Free registration is required. Please register at www.nyseagrant.org/losportfish. For more information or directions, contact: Jesse Lepak, New York Sea Grant at SUNY Oswego: 315-312-3042, or email [email protected].